To gently draw the ball and hit more consistent shots, try this Punch Shot Drill. Position the ball about 3" inside your left heel with your normal 8 iron stance. Set up to the ball favoring your weight 70% forward in order to hit the ground in the same place consistently. Make half swings, keeping keeping your arms long into a short follow through. Hold your finish with good arm extension, maintaining a good angle of inclination to the ground. Hit balls off the ground with your 8 iron, and off a tee with your driver. 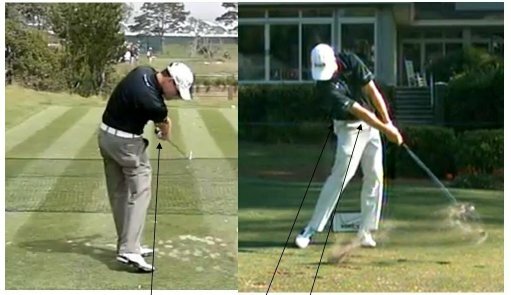 Keeping your arms relatively straight and extended keeps your swingpath more down and out. Do not roll your hands or forearms, allow the clubface to stay square to your swing arc in order to keep your initial shot direction line consistent. Allow your hips to slide and then extend to allow your body to keep turning, which will slow down the clubface rotation through the ball. This drill will help important aspects of your swing - ball contact, swingpath control, and proper release.